So we give bonuses despite the budget cuts, eh? That’s what I’d call the C+ Street bailout. Yay! As you may have seen from a previous post, there are also awards for foreign policy achievements, despite whatever. Except wait — one FSO got a well-deserved medal and the CINC was the receiver (of two awards), not the giver of the achievement awards. I’m kinda dizzy here — shouldn’t the CINC be the one giving out awards instead of receiving awards? Whose management brainchild is this inverse reward pyramid, anyway? For some reason this reminds me of the 1990’s when there were hundreds of unfilled positions worldwide. Folks kept harping about it, so finally, somebody up decided to eliminate all the unfilled positions down. And voilà! No more unfilled problems, see? So I actually did not fell off my chair when I saw that big ceremony at the Ben Franklin Room. As one seasoned diplomat once counseled a younger charge, “Never be the one who says that an idea is bad.” Not bad advice, just a very pragmatic one if you don’t want to be banished from the upper floors. But poor Dana Milbank of the Washington Post, of course he had no idea – and actually wondered if a “a prankster had hacked his way into the White House e-mail system” (Friday, January 16, 2009; Page A03) when he saw this advisory from the White House Office of Presidential Advance. With fanfare, they walked into the gilded Benjamin Franklin Room of the State Department yesterday: President Bush, the first lady, Secretary of State Condoleezza Rice and Rice’s deputy, John Negroponte. They had come to praise great people. Namely, themselves. Rice presented Laura Bush with a framed “Certificate of Appreciation.” Then she presented Bush with a “commemorative plaque.” And another commemorative plaque, which, like the first, was sheathed in a gold curtain. Finally, she had an honor guard present her boss with five flags in nifty triangular boxes. “Mr. 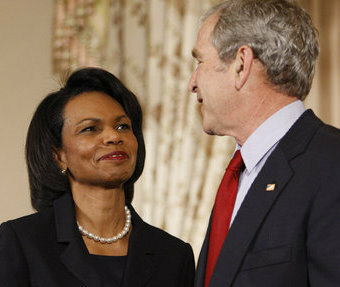 President, we’ve been through a lot together,” Rice told Bush. “We’ve been through a lot together,” Bush told Rice. “Mr. President, history’s judgment is rarely the same as today’s headlines,” Rice assured Bush. “History will say that Condi Rice was one of the great secretaries of state our country has ever had,” Bush assured Rice. Bush had no awards for Rice, but he did come with praise for her (“She’s like my sister”) and for himself. “In short, we’ve made our alliances stronger, we’ve made our nation safer, and we have made the world freer,” he said. In December 2004, President Bush awarded the Presidential Medal of Freedom to L. Paul Bremer III, Tommy R. Franks, and George J. Tenet at the White House. How come no medals for “Ponte” and Condi? The West Wing will turn into a ghost town at 9 p.m. today. We don’t award medals on weekends, do we? There was a big do at the State Department yesterday. Secretary Rice led the ceremony to commemorate the outgoing administration’s Foreign Policy Achievements (2001-2009) in the Benjamin Franklin Room and gave a nice speech. I find it interesting that Secretary Powell was not invited to participate in the ceremony considering that he “owned” the first half of what was commemorated at the event. Mrs. Bush got a State Department’s Certificate of Recognition and President Bush got a couple of commemorative plaques with shiny things on them. Click here to view a 35-minute video of the ceremony. But I must warn you — the video clip contains explicit articulation from members of a mutual appreciation club. We don’t want to give anyone a heart attack. Also, if you want to know what nickname President Bush has assigned to Secretary Negroponte, this is a “must-see” video. As President, I have entrusted the Foreign Service with our nation’s most critical diplomatic missions. I have relied on your expertise, your advice, and your good judgment. I will always be grateful for your valor and your professionalism. MILITARY AIDE: Ryan C. Crocker. 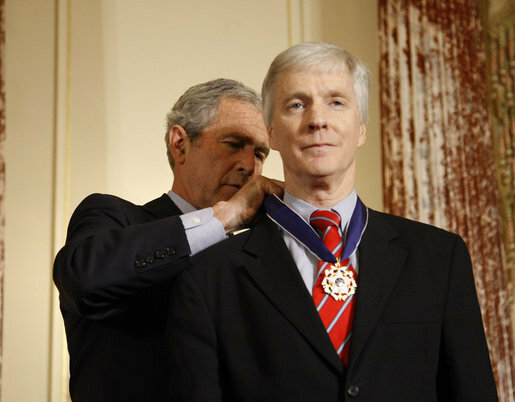 For nearly four decades, Ryan Crocker has advanced our nation’s interests and ideals around the world. Embodying the highest principles of the United States Foreign Service, he has cultivated and enhanced our relations with pivotal nations. Following the attacks of September 11th, 2001, he worked to build a worldwide coalition to combat terrorism and help millions of oppressed people travel the path to liberty and democracy. The United States honors Ryan C. Crocker for his courage, his integrity, and his unwavering commitment to strengthening our nation and building a freer and more peaceful world. I think the speech writers forgot something here. Insert somewhere in paragraph #7: In 2002, Ryan Crocker co-wrote a secret memo examining the risks associated with a U.S. invasion of Iraq. The six-page memo, titled “The Perfect Storm”, stated that toppling Saddam Hussein could unleash long-repressed sectarian and ethnic tensions, that the Sunni minority would not easily relinquish power, and that powerful neighbors such as Iran, Syria and Saudi Arabia would try to move in to influence events. It also cautioned that the United States would have to start from scratch building a political and economic system because Iraq’s infrastructure was in tatters. The secret memo was deep-sixed and he did the best he could in dealing with the aftermath.